I may have been watching too much snowboard and ski cross. (A knuckle is a small hummock of a jump that can catch you unaware and leave you floundering with little speed for the next bit of the course). Given that we are now heading downhill into the final straight of the Winter Olympics, one would assume that I’d be gathering speed (see what I did there?) with my Ravelympics projects. One would assume incorrectly! 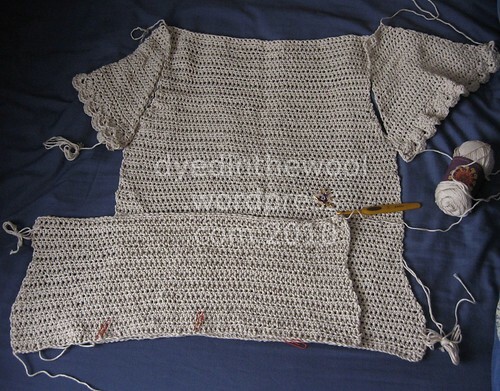 My plan for this yarn is to quickly turn it into a waistcoat that I will actually be able to wear this year! I’ve done absolutely nothing on anything else. It’s all my mum’s fault for tearing/straining the muscles in her left shoulder, necessitating my assistance in a lot of stuff. Caring time is inversely related to crafting time! Oh, tell a lie! 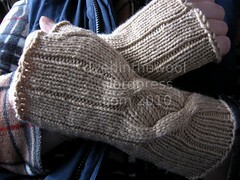 I did manage to make myself a pair of Dashing fingerless mittens! I messed up the second cable cross (I went too early) but I decided I quite liked the faux bois look I ended up with and so left it! To conclude – I’ve actually done quite a lot and I should stop underestimating my ability to craft in a crisis. I think these are my first non-washcloth, non-granny square crocheted finished object. I’m sure a more experience person could have knocked these out in less time, but a more experienced person would not have made the second slipper into a triangle instead of a square. It’s OK, I’m laughing now. The pattern, despite it’s brevity, is not easy. The author is not a native English-speaker and I think some things have been lost in translation. 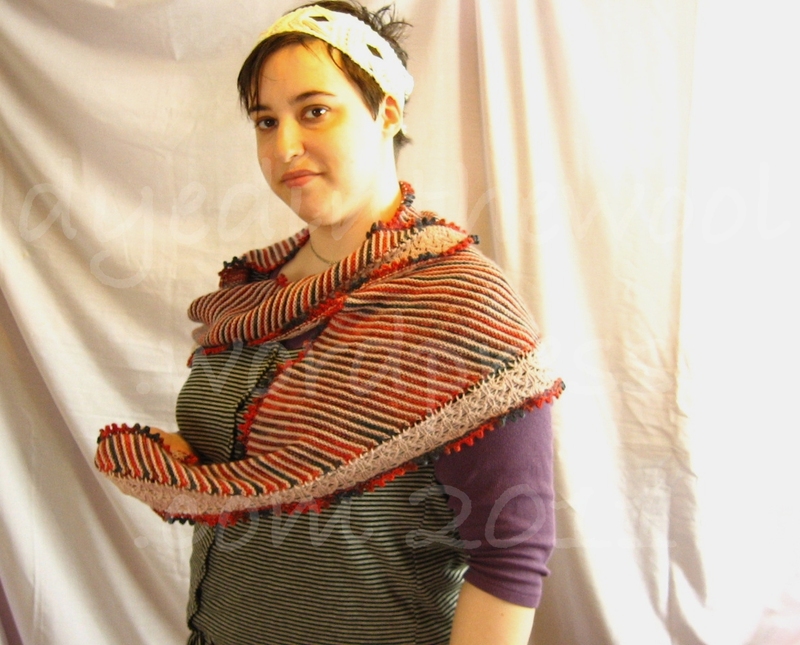 With pattern and diagram [DELETED LINK AT REQUEST OF DESIGNER] in hand, though, I made it through. I wouldn’t recommend this to a complete beginner since you sort of have to know what you’re going to stick where and what it’s suppose to look like. If your immediate response was “For a little while”, then feel free to join me in weeping for another Joss Whedon vs Fox Battle, in which Mr Whedon lost. I’m not solely reflecting on the demise of TV show, but on me (my favourite subject!). The amazing shiner is gone, and the ear infection seems to be on the way out. I’m still dizzy and bit woozy, but I’m much better than I was. Thanks for all the good wishes. I’ll probably never be well, but I can at least try to be less ill! 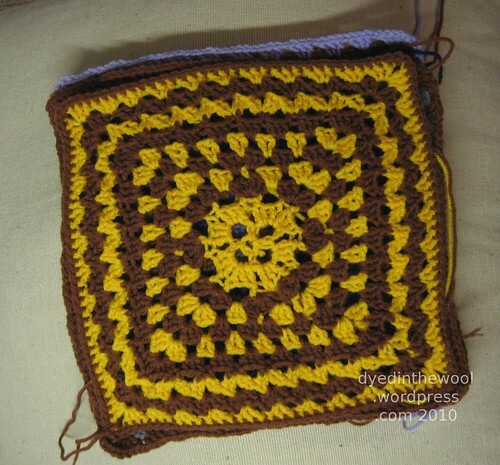 It’s not the Sistine Chapel, but it’s my first non-standard crochet granny square. There were tears, there were tantrums and there was a lot of ripping out, but with help from my fellow crochet-along-ers on Ravelry, I made it! 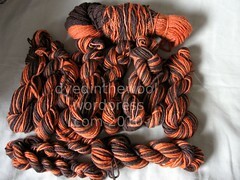 Yarn: Regia Silk 4-ply (wool/silk/nylon). Approx. 400 yds/360 m used for both socks. Needles and knitting style: One 2.5 mm Addi 100 cm long circular needle for Magic Loop. Worked two-at-a-time. Combination/Eastern Uncrossed style throughout. 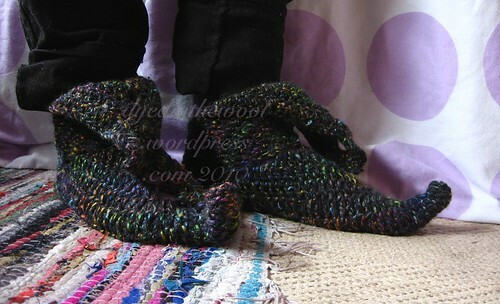 Sock style: Toe up with gusset heel and wedge toe. Made size L (9.25 in circumference) for my mum’s feet. Leg height approx. 8 in/20 cm. 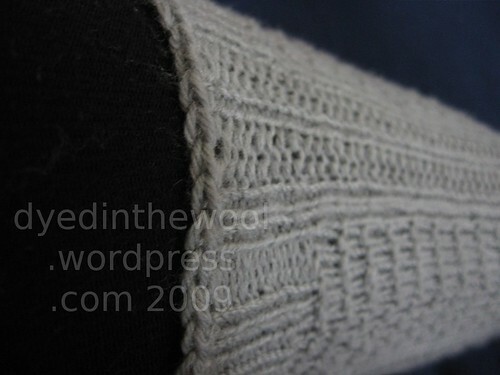 Altered ribbing at top to continue garter stitch motif from pattern. Cast off cuff with 4 mm crochet hook to make it as non-binding as possible. Used the Magic Loop technique for the first time and really liked it. 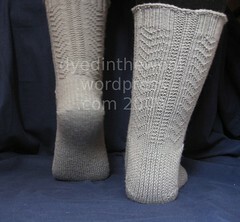 It was easy to use with the toe-up pattern and casting on both socks at the same time was very simple. 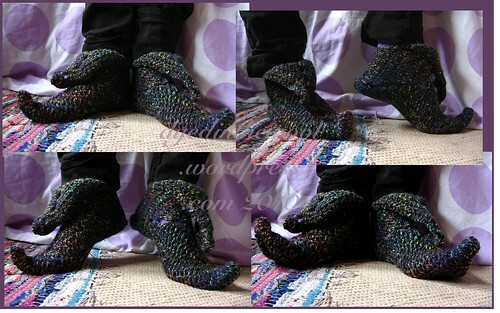 Used Judy’s Magic Cast On for the toes. I really can’t see me using any other cast on for toe-up socks from now until the end of time. 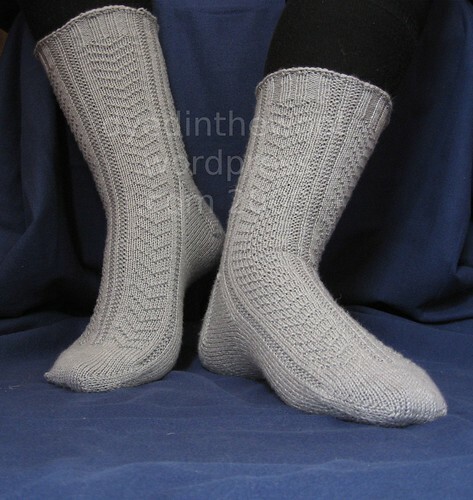 The fit of these socks is great (my mum nearly didn’t get to keep them) and the pattern is well written (as usual). The stitch motif was pretty easy to memorise.